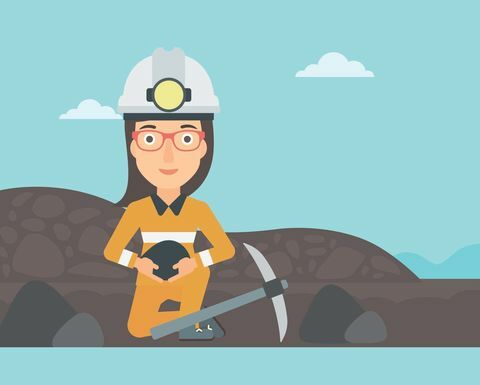 Mining is very much still dominated by men, but there are signs the industry is making progress – albeit slowly. 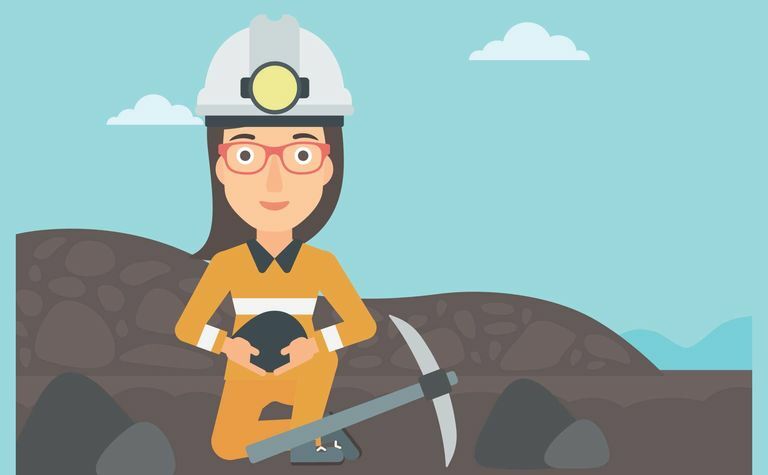 According to the Workplace Gender Equality Agency, as of June 30, 2018, women comprised 16.7% of the mining sector, up from 16.1% in 2017 and 15.7% in 2014. That still makes mining the industry with the lowest proportion of females overall. The level of women in management rose from 14% in 2014 to 17.2% in FY18, while more significantly, the number of CEOs jumped from 2.7% to 7.5% over the same period. The gender pay gap in mining fell to 14%, from 14.7%, the seventh-lowest out of 19 industries, while the base salary full-time pay gap in mining was just 10.6%, down from 11.3%. At board level, Fortescue Metals Group continues to set an example for corporate Australia, with over half of its directors being female. CEO Elizabeth Gaines said the company had seen its female participation in the December half increase to 18%, including 24% in senior management positions. "In my view, women in leadership positions are critical to ensuring we have a pipeline of talent for c-suite positions in corporate Australia, so that we continue to see improvements in diversity across our country," she said. Gaines said in order to benefit from increased diversity in the resources sector, the industry also needed to ensure it was building a greater pool of talent in trade roles. "Nationally, female participation in the trades servicing the mining industry is only 1% and at Fortescue we are committed to supporting women who are ready to pursue a career in the trades," she said. "Programs such as Fortescue's Trade Up provides female team members with practical pathways to gain trade qualifications. Eleven females were part of Fortescue's Trade Up in FY18, more than 40% of the overall participants. At our rail operations, we are trialling a traineeship program aimed at female school leavers, offering entry-level positions and providing clear career opportunities." BHP is making slower than targeted progress on its aspirational goal to achieve gender balance by 2025. Over FY18, it added 915 more women than it did the previous year, increasing the representation of women by 1.9% to 22.4%, below its targeted 3% annual growth rate. It had an external hiring ratio of 39.8% women, up from 10.4% in FY15. CEO Andrew Mackenzie was asked last year if the company were discriminating against men in its hiring practices, to which he replied: "Absolutely not." "We have a bias towards high performance - that doesn't sound like gender discrimination to me," he said. Last week the company promoted three women to its executive committee. Recruitment firm Harrier said it was important when setting targets that organisations considered the structural and cultural changes required to make them possible, as research shows where targets exist, low accountability for delivering on them actually increases bias against women. "Without focus and accountability, targets are nothing more than a branding exercise to attract women to companies that will fail to uphold their promises," Harrier CEO Kelly Quirk said. "We risk losing that talent from the industry forever." South32 CEO Graham Kerr was recently appointed as chairman of CEOS for Gender Equity and the organisation recently moved into South32's Perth headquarters after being offered office space. South32's progress on diversity goes beyond that, but is yet to be reflected in the statistics below. The company recently appointed Karen Wood as chairman as of next month, and on May 1, Katie Tovich will become chief financial officer. St Barbara is another leader in the cause, with CEO Bob Vassie being a pay equity ambassador for WGEA since 2014 and a member of the AusIMM Council for Diversity and Inclusion. The company has 40% women on its board and 27% in leadership roles, and as at the end of February, the company had 25% female employees (figure in table is as of the end of FY18). Its overall pay equity gap has reduced from 43% in 2007 to 12% at the end of 2018 and it had a nil gender pay gap in like-for-like roles. St Barbara has been a WGEA Employer of Choice for Gender Equality since 2014 and is the only ASX mining company to be certified. "The question I would ask is, why is that the case?" Vassie said last month. MNN put that question to WGEA and got no response. 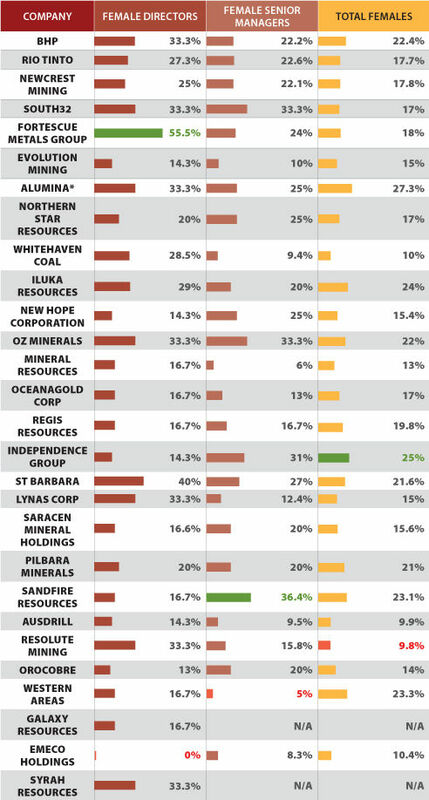 Below are the statistics on female participation across the ASX mining and contracting space, sourced from the companies and WGEA reports. The stats are imperfect. Some are as of June 30, some as of December 31 and others are as of now. An N/A means the company either didn't respond or provide the requested information. There are also inconsistencies in what is classed as a senior manager. However, it paints a picture of where the industry is at. 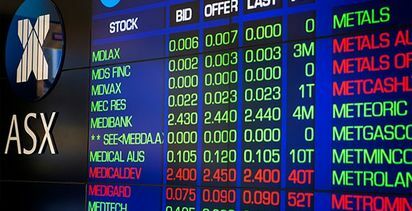 Equipment supplier Emeco is the only ASX 200 miner or contractor not to have female representation at board level. Companies with operations overseas - Orocobre, Resolute Mining and Syrah Resources - were quick to point out that lowered their overall figures with many companies having a lower level of female workers due to cultural reasons. While Resolute had the lowest level of female employees overall at 9.8%, its level of female participation in Australia was 22.3% overall and 20.8% for managers. It was a similar story for Orocobre, which reported 38% female employees in Australia, and Syrah, which reported 43% female employees across its corporate divisions. Technically, Alumina had the highest total female employees, though as largely an investment company, it has just 11 employees. 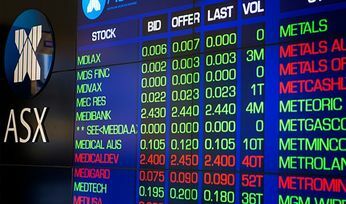 It does not include the company's interest in the Alcoa Worldwide Alumina and Chemicals. Alcoa of Australia is the only other miner to have WGEA Employer of Choice accreditation. "I firmly believe we are all accountable to make a difference and it's everyone's job to build a culture of equality, encourage diversity and enact positive change in our workplace," Alcoa of Australia chairman and MD Michael Parker said. "Gender balance makes the workplace better. I want women to achieve financial independence, pay parity and enjoy career opportunities throughout every life stage." Evolution Mining's percentage of senior managers was at the lower end and executive chairman Jake Klein said the company recognised female participation was low and needed to increase. "The proportion of women in Evolution's workforce is improving and we're always looking for further ways to attract the most talented people into our business," he said. "Half of our 2019 intake on our graduate program were female and we have also introduced some flexible work arrangements and continue with programs to support participation and career development." Independence Group head of people & culture Sam Retallack said the company had put in place a number of initiatives to boost female participation. Those include development programs, 16 weeks of paid parental leave (for either parent), superannuation on paid and unpaid parental leave, four weeks additional pay after six months following a return to work, paid domestic violence leave, flexible work options, and a program focused on growing a culture of inclusion. "Gender diversity isn't just a buzzword"